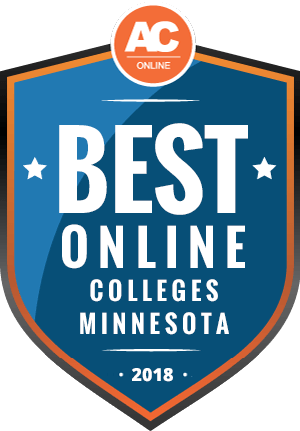 Why Choose Minnesota for Online Higher Education? Accredited online colleges in Minnesota provide first-time and nontraditional students with the knowledge and hands-on training necessary to pursue lucrative careers. The Georgetown Center on Education and the Workforce projects that, by 2020, 74% of Minnesota jobs will require candidates to pursue postsecondary education. This percentage ties with Colorado as the highest in the United States. Higher education leads to more career opportunities and higher pay. According to the Minnesota Office of Higher Education, bachelor’s degree holders earn approximately $20,000 more than professionals who only possess a high school diploma. Both in-state and out-of-state students benefit from affordable online degrees in Minnesota. This guide provides ranked school profiles and information on tuition and financial aid. Distance learners also gain insight into the enrollment process, including application deadlines and credit transfer. Aggregating information from the Integrated Postsecondary Education Data System, the table below displays 2016 distance education enrollment in Minnesota. Approximately 9,600 undergraduates and 8,000 graduate students earn their certificates and degrees entirely online. Online programs in Minnesota provide cheap tuition and flexible schedules that benefit single parents, full-time workers, and other underserved student populations. Distance education also comes with accelerated program options that enable professionals who work in shrinking labor industries to efficiently develop the skills needed for a career change. The best online colleges in Minnesota deliver affordable tuition at prices that either match or fall far below in-state rates. Many colleges and universities, predominantly private ones, ignore a student’s residency status when calculating tuition. Public institutions may charge out-of-state residents higher rates, in which case students can apply for in-state eligibility; this means establishing residency, a process that requires students to live in Minnesota for at least one year for a purpose other than attending college. Out-of-state learners may access discounted tuition by engaging with individual reciprocity agreements or the Midwest Student Exchange Program. This guide provides further details on reciprocity in a later section. Students can find tuition differences below. In general, accredited online schools in Minnesota offer lower tuition rates to online students than on-campus learners. For example, distance learners at Hamline University pay $5,141 each semester for full-time enrollment, about $200 less than the average in-state, four-year student. By pursuing online learning, students also save money on housing and commute. Over 42% of students attending accredited online colleges in Minnesota reside out of state. As the table below shows, graduate students outnumber undergraduates. This ratio reflects national trends, since graduate students place greater importance on an institution’s academic rigor and career development opportunities than its proximity to their hometown. When searching for out-of-state online programs, students should look into tuition reciprocity agreements. They should also discern distance education state authorization that may restrict where they can attend college. Accredited online schools in Minnesota facilitate individual reciprocity agreements with colleges and universities in Wisconsin, North Dakota, South Dakota, and the Canadian province of Manitoba. The state also operates limited reciprocity with Iowa Lakes Community College. Discounts vary by residency area, but these students generally pay in-state tuition prices when attending Minnesota public institutions. Out-of-state students may also access discounted tuition by engaging with the Midwestern Higher Education Compact (MHEC). MHEC negotiates reciprocity deals through its Midwest Student Exchange Program (MSEP), a consortium of over 100 schools from 10 states. The exchange ensures that participating public institutions do not charge students more than 150% of in-state prices for specific programs. Private schools offer out-of-state students a 10% tuition discount. Candidates do not need to submit a separate MHEC document. Exchange schools embed the process into their own applications. The State Authorization Reciprocity Agreement (SARA) strengthens interstate relationships between online colleges and universities, which expands academic access and enhances overall quality. States voluntarily join SARA through their regional compacts. With the permission of their state, higher education institutions may offer online courses, certificates, and degrees to any other SARA member. SARA covers the majority of U.S. states and territories, with the exceptions of California and the Northern Mariana Islands. Students can find SARA-approved online schools in Minnesota here. The following profiles detail the best online colleges in Minnesota, with emphasis on quality and affordability. Listed schools must meet minimum qualifications, including non-profit and accredited status. They must also provide tuition prices below designated thresholds and at least three online programs. Each institution receives points based on performance within the ranking metrics. Categories include net price for in-state students, breadth of program offerings, student-teacher ratio, student services, and financial aid packages. We also take graduation rate and timeline into consideration. These rankings, therefore, strive to meet students’ diverse needs, enabling them to find the online program that matches their interests and goals. This section contains detailed answers to frequently asked questions concerning program options, costs, financial aid, and credit transfer. Students should use the information here as a starting point for their own research. When in doubt, they should consult their prospective schools’ admission counselors. Do online credits cost more or less in Minnesota? Distance education programs offer more affordable tuition than on-campus programs. The best online colleges in Minnesota disregard residency status, providing flat rates for all students. Distance learners can also access discounted tuition through reciprocity agreements like the MSEP, which facilitates partnerships between Minnesota and nine other states. The Minnesota Office of Higher Education provides a tuition and fees chart for schools in the state. Students may compare prices based on residency status and reciprocity agreements. As expected, two year institutions deliver the lowest tuition; Anoka-Ramsey Community College offers a yearly rate of $5,073, while Northwest Technical College charges $5,488. Campuses within the University of Minnesota system provide prices that range from $11,822-$18,843. Private institutions charge the highest tuition: Macalester College students pay $54,344 per academic year. Certain schools may charge slightly higher tuition rates for online students to help pay for dedicated information technology services and software updates. For example, Anoka-Ramsey Community College charges distance learners $182.75 per credit, while traditional students pay $144.95. However, online students ultimately pay less for their degree by saving money on housing, commute, and campus fees. Which Minnesota schools accept the most transfer credits? The best online colleges in Minnesota emphasize accessibility through asynchronous classes and generous transfer policies. Students can find out how many undergraduate credits private schools in the state accept by consulting Minnesota Private Colleges. Remarkably, the University of St. Thomas does not impose a limit on how many credits students can transfer toward bachelor’s degree completion. Concordia College comes in second place, allowing 98 transfer credits in a 126-credit curriculum. In general, graduate students may fulfill up to half their degree plan with transfer work. Through Transferology, students with prior academic experience can find out if their courses transfer to other schools by searching for equivalent classes. The website also works in reverse, allowing students to find summer or winter classes at another school that will transfer back to their home colleges and universities. Students can even search for classes abroad. For comprehensive academic guidance, students should consult Minnesota Transfer. The website connects users with schools’ transfer websites and articulation agreements. Students receive support when searching for classes and developing transfer plans. The website also provides extensive information on the Minnesota Transfer Curriculum (MnTC). Established by Minnesota State Colleges and Universities, the MnTC certifies courses in ten goal areas, including communication, natural sciences, and the humanities and fine arts. Classes within these areas transfer seamlessly between 37 participating schools. Will any online colleges in Minnesota accept a GED? Admission criteria vary by school, academic department, and even individual programs. Students can get a sense of which accredited online schools in Minnesota unconditionally accept the General Education Diploma (GED) by visiting the state’s office of higher education. Students may also find general admission requirements for Minnesota State Colleges and Universities. The majority of community and technical colleges enroll GED candidates. Traditional four-year institutions prove more discerning, especially when it comes to their most popular or prestigious programs. Here, admission usually necessitates minimum GPA, high school class rank, and standardized test scores. If a school does not offer direct enrollment for GED candidates, students can build their academic portfolio by earning high SAT/ACT scores and an associate degree. Many two-year schools in Minnesota provide direct transfer pathways into bachelor’s programs. For more information, students should consult Minneapolis Community Education, Minnesota Adult Basic Education, and the Minnesota Literacy Council. How many academic terms per year do online colleges in Minnesota offer? The majority of accredited online colleges in Minnesota facilitate semester-based classes, with three start dates each year. By taking asynchronous classes, students can access learning materials and engage with peers and instructors at their convenience. Online courses usually require learners to complete weekly assignments. Prospective learners can find out the start dates of Minnesota State Colleges and Universities by consulting this academic calendar. Schools like Concordia University, St. Paul accept applications on a rolling basis. Concordia and the College of St. Scholastica provide seven- and eight-week online classes, respectively. Accelerated coursework not only allows students to earn their credentials quickly, but also lets them maintain work and family responsibilities. Through these intensive programs, students can earn associate and master’s degrees in one year and their bachelor’s in two. Based in the Twin Cities, Argosy University offers accelerated degree plans and flexible enrollment, with online classes starting every few weeks. Argosy further supports distance learners with institutional scholarships and grants. Although the University of Minnesota does not provide weekly or monthly start dates, online students benefit from self-paced online classes. The university offers these courses during extended terms, with learners given up to nine months to complete them. Rasmussen College operates a similar course structure with its Flex Choice options. Which online colleges will accept FAFSA in Minnesota? All accredited colleges in Minnesota facilitate scholarships, grants, and work-study opportunities through the Free Application for Federal Student Aid (FAFSA). To use the FAFSA, students must meet basic eligibility criteria, which include U.S. citizenship or eligible non-citizenship. Unfortunately, this means undocumented students cannot access funding through the FAFSA. In addition to funds that students do not need to pay back, the FAFSA also lets students borrow low-interest subsidized and unsubsidized loans. Distance learners should consult their prospective schools’ financial aid pages for exact details and deadlines. The Minnesota Office of Higher Education provides in-depth financial aid information and guidance. Students can learn about eligibility, application processes, and military service education benefits. The office connects students to state awards facilitated by the FAFSA, including the Minnesota State Grant, the Minnesota Indian Grant, and Grants for Students with Intellectual and Developmental Disabilities. The state also provides a loan repayment program for educators. Are there any free online classes I can take from Minnesota colleges? After the state government unbanned free college classes in 2012, Minnesota schools began offering Massive Open Online Courses (MOOCs). MOOCs function as asynchronous classes, incorporating interactive features like videos, projects, and quizzes. Students can take individual MOOCs or earn degrees and professional certificates. Schools offer many MOOCs at no cost. Others provide free introductory materials, but require students to pay for full features. Students can directly search offerings on the MOOC website. They can also look for classes through major providers, including Coursera, developed by Stanford professors, and edX, operated by Harvard and MIT. In addition to academic offerings, Coursera provides workforce development classes for government organizations and businesses. Udacity focuses on technology and career training courses. Based in the United Kingdom, FutureLearn emphasizes social learning. Websites like Class Central enable students to search for MOOCs by subject, university, and provider. The University of Minnesota serves as the main MOOC provider in the Gopher State. Through Coursera, the school delivers five specializations, a series of interconnected classes leading to capstone projects, and certifications. UMN students pick from healthcare marketplace, human resource management, user interface design, recommender systems, and software development lifecycle. The university and Coursera both offer financial aid. Crown College and Minneapolis College of Art and Design also operate MOOCs. How can I find the online program options at Minnesota’s colleges? The Minnesota Office of Higher Education provides a list of colleges and universities that offer distance education. The office also supports prospective students with a list of important questions they should ask when discerning the validity of an online higher education institution. Distance learners also gain insight into academic accreditation and professional licensure. Online students can seek out program options through Minnesota Private Colleges. The 17 participating schools include St. Olaf College, Bethel University, and Minneapolis College of Art and Design. The College Finder tool enables students to search by program type, field of study, and delivery method, like fully online, blended, or evening classes. The website also provides learners with application guidance and financial aid information. Lastly, Minnesota State Colleges and Universities offers extensive resources and tools for distance learners, including knowledgeable staff ready to answer any questions. Students can search for online programs and courses by keyword, degree level, category/subcategory, and delivery method. Students may also access online tutoring, career workshops, and other academic services through the website. The FAFSA enables students to access multiple forms of funding simultaneously, including the Federal Pell Grants for undergraduate students with exceptional financial need. Unless they enroll in a teacher training program, post-baccalaureate candidates cannot receive Pell awards. Students attending accredited online colleges in Minnesota should also seek out awards from local business, professional associations, and nonprofit organizations. This section details five such opportunities. Facilitated by the Minnesota Office of Higher Education, this award supports students who demonstrate financial need and at least one-fourth Native American ancestry. Applicants must enroll at least half time in an accredited in-state college, university, or vocational school. If they maintain stellar academic performance, recipients may renew the scholarship for up to ten years: five years of undergraduate study and five years of graduate study. Students with sensory impairments or physical disabilities can receive this award. Candidates must be Minnesota residents enrolled full time in an undergraduate or technical training program. Students should submit a personal statement explaining how the scholarship supports their academic and career goals. The application process also includes multiple interviews. Minnesota high school graduates going into their third or fourth year at an in-state college or university may apply. Candidates must major in elementary education, with plans on earning their initial teaching certificate in the state. The scholarship committee prefers students who live in the Buffalo Lake area. Applicants must enroll full time at an accredited college or university in Minnesota. They also need to demonstrate financial need and possess a minimum 3.0 GPA. The scholarship committee accepts applications from high school students, undergraduates, and graduate candidates. Required documents include academic transcripts, a personal essay, and at least two recommendations. U.S. citizens attending accredited online universities in Minnesota may apply. Candidates must earn a minimum 3.0 GPA. Application materials include the most recent academic transcripts and FAFSA. Students must also submit a personal essay, detailing the importance of an online degree to their future goals.